Archaeologists working in Germany have uncovered evidence of a violent clash between a pair Early Neolithic farming communities, a grim encounter that resulted in a surprising number of deaths—and may have even involved torture. Violence on this scale isn’t what immediately comes to mind when we think of Europe’s first farmers, but as a new study published in the Proceedings of the National Academy of Sciences shows, our conceptions of what life was like during this transitional time needs to be seriously reconsidered. A research team led by Christian Meyer of the University of Mainz analyzed the remains extracted from a mass grave at the Schöneck-Kilianstädten site, an ancient settlement located near Frankfurt, Germany. The grave itself was accidentally discovered back in 2006 by a construction crew. These early farmers, known as the Linear Pottery culture, are known for their distinctive ceramic decorations. A sophisticated people, they typically buried their dead in ritual fashion, adorning graves with ornaments and other offerings. Composite image of the mass grave (Credit: Christian Meyer/PNAS/University of Basel). Which makes the discovery of a 7,000-year-old, 23-foot (7-meter) long burial pit all the more disturbing. The mutilated bodies of 26 adults, some of them children (10 under the age of 6), were unceremoniously tossed into the mass grave. Analysis of the skeletons revealed horrific injuries, including skull fractures caused by blunt-force Stone Age weapons. In close-quarter fighting, attackers made use of bow and arrows in an apparent ambush; animal bone arrowheads were found still attached to the buried bones. Most of the skeletons were male, an indication that girls and women were not involved in the fighting and/or they were abducted by the invading forces. Skull damage on an 8-year-old child (Credit: Christian Meyer/PNAS/University of Basel). Disturbingly, the remains also exhibited signs of torture. Evidence shows that the shin bones of the deceased were deliberately smashed, though it’s not obvious if the injuries were sustained before or after death. The archaeologists suspect the former, however. Indeed, this isn’t the first time that archaeologists have found something like this. In the 1980s, two similar Neolithic mass graves containing more than 100 bodies were uncovered in Germany and Austria. 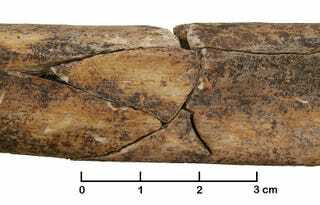 The new discovery strongly suggests that these clashes were not isolated or infrequent; during the Early Neolithic, it appears that farming communities went to war against rival farming communities. Above image: Severe injuries inflicted either shortly before or after death. The skull belonged to a child between 3 to 5 years of age. (Credit: Christian Meyer/PNAS/University of Basel). It’s difficult to discern a motive for this attack and others like it, but the researchers suspect that the systematic attempt to annihilate entire communities may have been the result of overpopulation in the area, or the product of poor crop yields, which may have been the result of natural climate change.